If this article is your first visit to the SQL Server Transaction Log series, I recommend you to check the previous articles (see the TOC below), in which we described the internal structure of the SQL Server Transaction Log, the vital role that the Transaction Log plays in keeping the database in a consistent state and recovering the corrupted database or mistakenly modified table to a specific point in time. We discussed also in this series the three recovery models, Full, Simple and Bulk-Logged, that controls how the transactions will be written to the SQL Server Transaction Log file and finally how to manage and monitor the SQL Server Transaction Log growth. 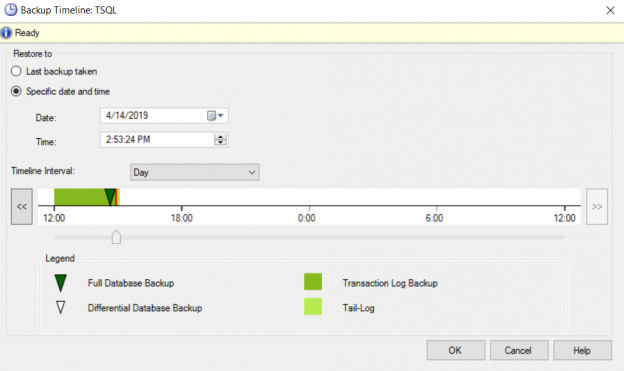 Building all the basic information from the previous articles, we are ready now to discuss deeply in this article the difference between the SQL Server Transaction Log backup, truncate and shrink concepts and how to perform these operations. When configuring your database with the Simple recovery model, the SQL Server Transaction Log will be marked as inactive and truncated automatically after committing the active transaction. This is not the case with the Full and Bulk-Logged database recovery models. When the database is configured with Full recovery model, the SQL Server Transaction Log in the Transaction Log file will be marked as inactive after committing the transaction, without being truncated automatically, as it will be waiting for a Transaction Log backup to be performed. Recall that only the Transaction Log backup, but NOT the database Full backup, will truncate the Transaction Logs from the Transaction Log file and makes it available for reuse. If no Transaction Log backup is taken from the database, the Transaction Log file will grow continuously, without truncation, until it runs out of free space. On the other hand, the Transaction Log backups that follows the first Transaction Log backup will take backup for all transactions that occurred in the database since the point that the last Transaction Log backup stopped at. The Full backup and all following Transaction Log backup until a new Full backup is taken is called Backup Chain. This backup chain is important to recover the database to a specific point in time, in the case of any mistakenly performed change or database corruption. The frequency of the Transaction Log backup depends on how important your data is, the size of the database and what type of workload this database serves. In the heavily transactional databases, it is recommended to increase the frequency of the Transaction Log backup, in order to minimize the data loss and truncate the Transaction Logs to make it available for reuse. If the database is damaged, it is recommended to create a tail-log backup to enable you to restore the database to the current point in time. A tail-log backup is used to capture all log records that have not yet been backed up. This will help in preventing any data loss and to keep the log chain complete. SQL Server Transaction Log truncation is the process in which all VLFs that are marked as inactive will be deleted from the SQL Server Transaction Log file and become available for reuse. If there is a single active log record in a VLF, the overall VLF will be considered as active log and cannot be truncated. When the database Transaction Log file is truncated, the truncated space will be freed up and become available for reuse. But the Transaction Log file size will not be decreased, as the truncated space will not be deallocated. On the other hand, the process of recovering the Transaction Log space by deallocating the free VLFs and returning it back to the operating system is called a Transaction Log Shrink. operation. The Transaction Log file shrink operation can be performed only if there is free space on the Transaction Log file, that can be available most of the time after truncating the inactive part of the Transaction Log. A shrink operation will be useful after performing an operation that creates a large number of Transaction Logs. In the next article of this series, we will discuss the best practices that should be applied to the transaction log in order to get the optimal performance from it. Stay tuned!